In this review we take a look at Sony’s Zeiss-branded full-frame 55mm f/1.8. It’s one of the more expensive 50mm-ish primes available for any camera system and is highly regarded for its sharpness. Let’s see how it handles astrophotography. 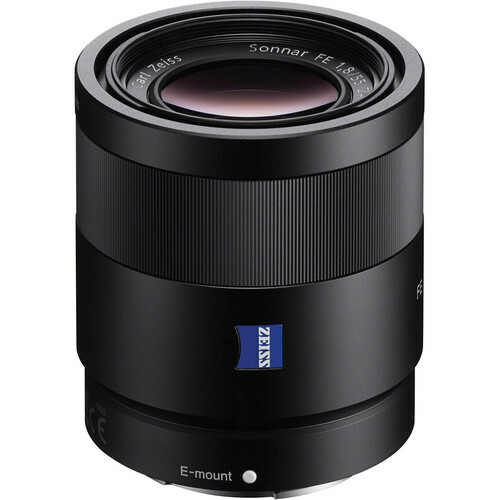 The Sony Zeiss FE 55mm f/1.8 Sonnar T* was one of the first prime lenses introduced for the full frame Sony E mount lineup. Its design strays a bit from the standard 50mm prime that we’re used to seeing. The lens body is narrow, sporting a 49mm front filter thread and it’s longer than you would expect for a 50mm-ish standard prime lens. It also has a concave front element, something you don’t usually see on a typical 50. It features a round 9-bladed aperture design, internal focusing, moisture and dust resistance, and an included petal-style lens hood. Its 7 element design has 3 aspherical lens elements, more than the typical 50mm-ish prime lens. It’s a fairly light lens at just under 10 ounces (281 g). At the time of writing, the lens sells for about $900-$1000. This isn’t your typical affordable standard prime. On any of the Sony a7 cameras, the 55mm f/1.8 is a well-balanced lens. It feels just the right size on my a7S. The body of the lens is a satin-black anodized aluminum alloy. It’s not the most resilient outer finish. Over time, my 55mm/1.8 has gotten a few dings and scrapes that have removed some finish on the edges of the lens. The included lens hood is very deep. It’s nearly half as long as the lens alone and so it really increases the length of the lens when installed. The hood also shares the same satin metal finish as the lens body, although the tips of the hood petals are a durable plastic. 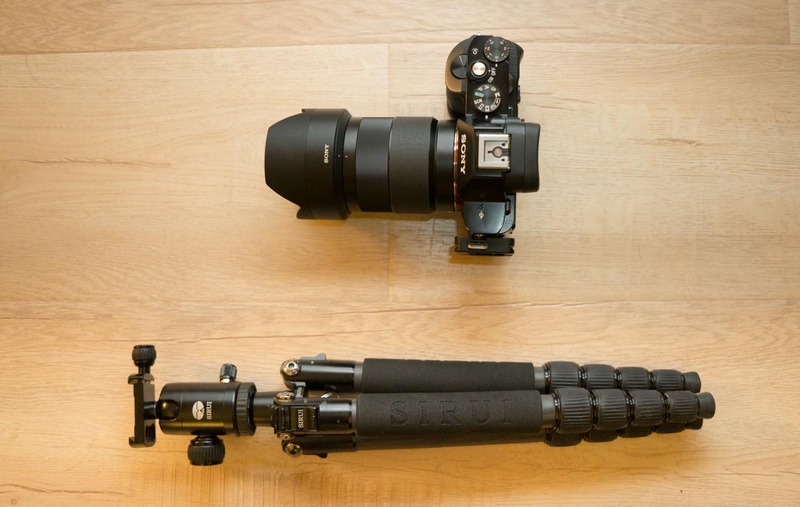 My Sony a7S mounted with the Sony Zeiss FE 55mm f/1.8 alongside my travel tripod, the Sirui T-025X. The focusing ring is similar to most of the other native lenses for the E mount system. It has a smooth, finely ridged surface that’s flush with the rest of the lens. It’s not the best feeling focusing ring in my opinion. I would much prefer the rubberized, gnurled or well scalloped focusing rings that can be found on most other lenses. Autofocus is super fast and quiet on the 55mm/1.8. It’s one of the quietest lenses that I’ve ever used, typical of the current offering of the Sony E mount system. Even on the more basic contrast detect autofocus system of my a7S, focusing is fast and accurate. On my a7II, which features a phase detection system, it’s even better. Not a primary consideration for astrophotography, but it’s nice nonetheless. Manual focusing is a little strange, but good. It’s a focus-by-wire system and it’s highly non-linear. Turn the ring slowly and the focus will move very finely, quickly and it will move very coarsely. That means that one position of the focusing ring does not correspond to a specific focus position. It takes some getting used to and is not very well suited to things like focus pulling during movie recording. The Sony Zeiss FE 55mm f/1.8 Sonnar T* has already earned a positive reputation among the photography community. It’s simply a very sharp lens. Astrophotography can be a little tougher on lenses. When shooting astrophotography, I like to judge a lens based on how well it renders pin-point highlights (like stars) on the edge of the lens. 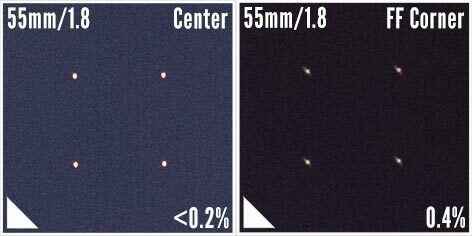 Many lenses, especially fast primes, can show deformed looking stars in the corner of the image. 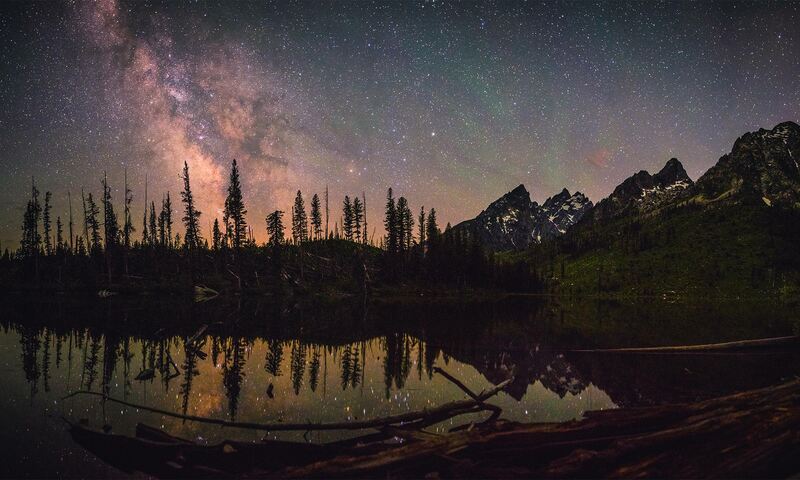 Aberrations like coma and astigmatism can become distracting elements to an astrophoto. 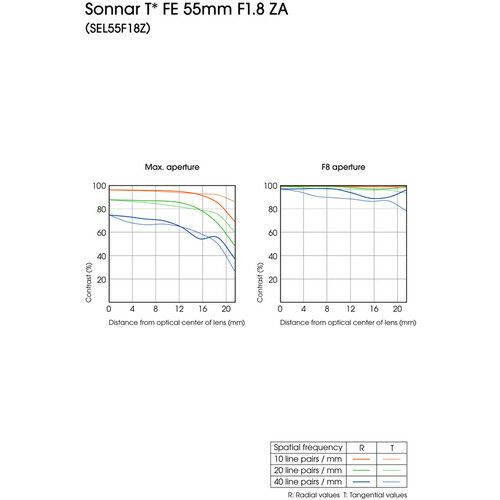 I ran the FE 55mm f/1.8 through my aberration test chart to try to characterize its aberration performance. In general, the 4 dots in each sample of the chart should look like pinpoints. Any deviation from a pinpoint is an indication of aberration. In my test, aberration sizes are measured in pixels relative to the frame height and expressed as a percentage of the frame height. In general 1.5% is poor, 1.0% is average, 0.5% is very good and <0.3% is excellent. 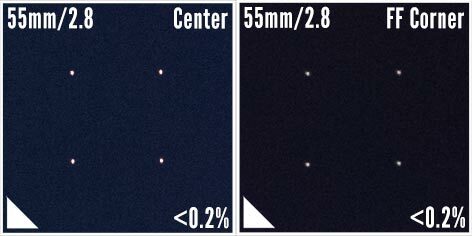 When the 55mm f/1.8 is stopped to f/2.8, nearly all signs of distracting aberrations are completely eliminated and stars appear like perfect pinpoints. At this setting, the lens seems nearly flawless. Just for comparison to a significantly cheaper, legacy 50mm lens design, check out the same test performed on the affordable Canon 50mm f/1.8 STM below. Wide open, stars on the Canon lens appear stretched into little winged shapes. Seeing the amount of aberration on the cheaper Canon lens puts into perspective just how good the Sony Zeiss FE 55mm f1/.8 is at producing low aberration images. At f/1.8, the Sony Zeiss FE 55mm is even better than the Canon at f/2.8. Impressive, but what else would we expect for this price? Something that isn’t as perfect on the FE 55mm is its vignetting or light falloff performance. At f/1.8, the difference in brightness from the center of the frame to the coner is quite dramatic. For single frame compositions, vignetting is not usually a huge problem, but it can be particularly problematic for making panorama stitches. Making a panorama with a 50mm-ish lens is one of my favorite methods for creating very high resolution images at night. Vignetting will usually make the seams of a panorama stitch visible. In order to reduce the effect enough to be acceptable for panoramas, the FE 55mm/1.8 needs to be stopped to f/2.8. Like I mentioned before, I really prefer to use my standard prime lenses to make small, usually 10-12 frame two-row panoramas. In this regard, the FE 55mm f/1.8 has worked to create some of my favorite, extremely high resolution photos of the night sky. 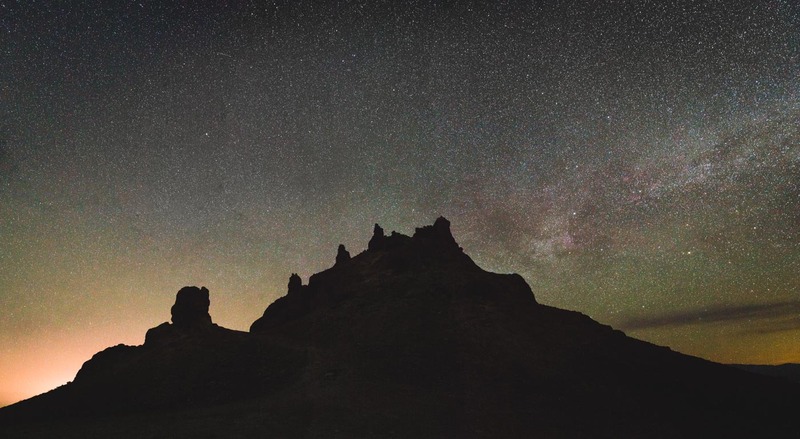 Above is a multi-frame panorama from Trona Pinnacles, California, the site of our first ever Lonely Speck meetup. Trona Pinnacles isn’t the darkest spot but it usually offers clear skies and its bizzare landscape makes for fun compositions. 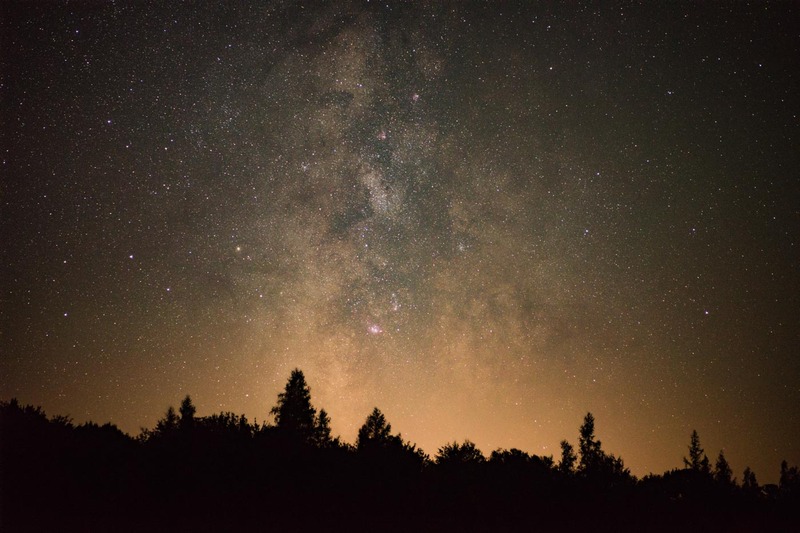 I’ve also used the 55mm f/1.8 to capture some narrower crops of the Milky Way. Below is a single frame composition shot from the Adirondacks in New York. The 55mm f/1.8 was the lens I used to shoot the constellation Orion for my LRGB tutorial. It took many exposures at f/1.8 and a lot of processing to capture the faint detail in Orion but I love the result. More recently, I used the 55mm f/1.8 to shoot some detailed crops of the constellation Cygnus from Trona Pinnacles. 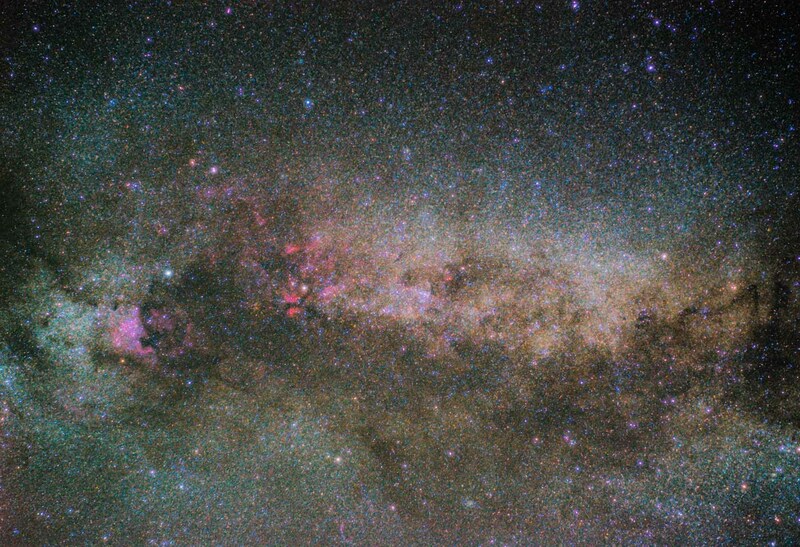 In the photo below, the North American Nebula is visible on the left, near the bright blue star of Deneb and the Veil Nebula is even barely visible, centered at the bottom edge of the frame. 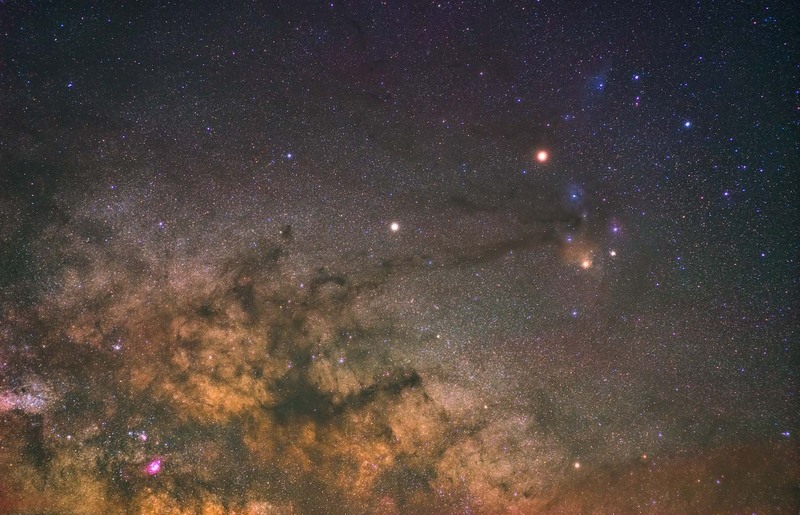 And also from Trona Pinnacles is this shot of the sky near the Milky Way galactic center, featuring my favorite part of the night sky: the Rho Ophiuchi region around the star Antares. 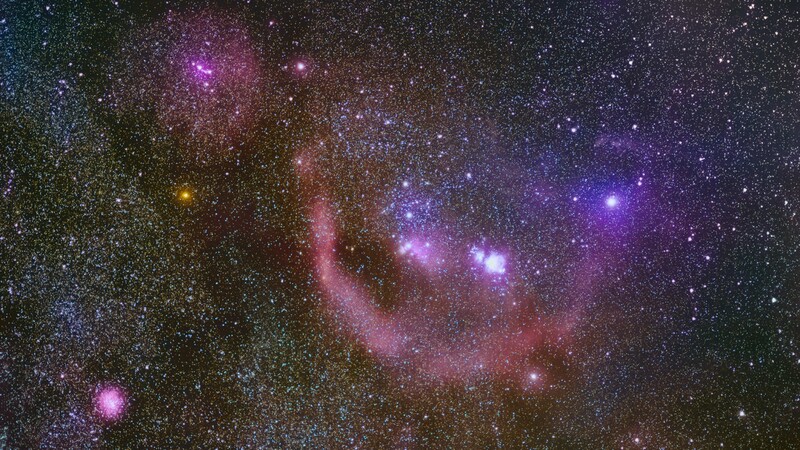 Saturn is visible in the center as the bright white star while Mars is the brightest, orange-reddish star to the right above the colorful region around the yellow star Antares. So what do I think? It’s almost perfect. The Sony Zeiss 55mm f/1.8 is extremely sharp and shows very good aberration peformance wide open at f/1.8. Stopped down to f/2.8, it’s simply excellent. Vignetting performance wide open is a little bit disappointing and that’s the one characteristic that keeps the 55mm/1.8 from being perfect. Note that light falloff is common on most fast standard prime lenses; I just would have liked the relatively expensive FE 55mm f/1.8 to be an exception. The solution for panoramas is to shoot stopped down to f/2.8 in order to mitigate the effects of light falloff. In this regard, the lens can be used to produce some very highly detailed, absolutely aberration free panoramas of the night sky. It’s the best standard prime I’ve ever used and I’ll likely keep it in my kit for the forseeable future. Highly Recommended. Thank you so much for the review, Ian. Found your website through a friend’s recommendation last year. What do you think is the best lens on the Sony A7 for night photography? (Looking to upgrade once Sony releases a new model next year.) Although you enjoyed the Sony FE 55 would you say the Voigtlander is the better lens or does it depend on the circumstance of it? Looking at investing in a new lens, but want one that’s duel purpose for street/ landscape while also being good at night photography. I’m married so I have to rationalize this to my significant other in terms of cost. Great article as always Ian! 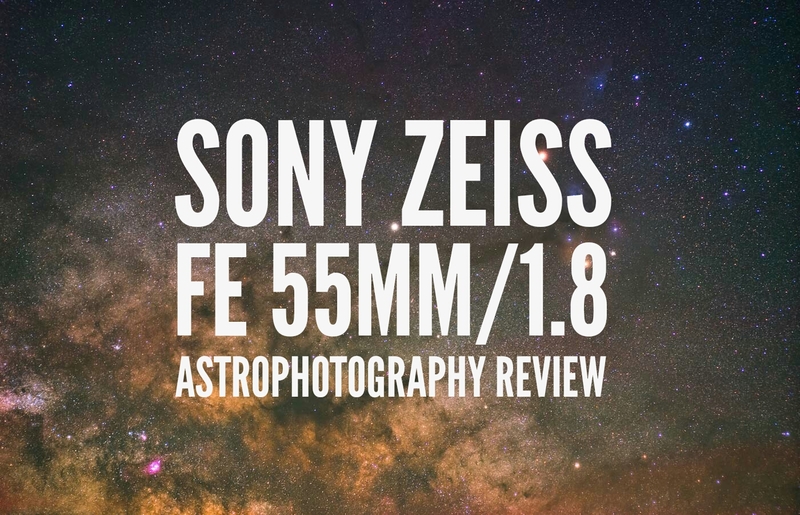 Curious if you have had a chance to try out the Sony-Zeiss 35mm f1.4 FE for astrophotography. If so, how did it perform? I was psyched to see your review of this lens sine its the only lens I have. I used it to photograph my first astro photo last night, and I got an awesome shot of the Big Dipper. I did it with image stacking, totally awesome. Oh and here’s the shot I got! Hi! I’m new to this, but how do you go about doing a panorama with long exposures and stacking? You mentioned you stack 30 images… So for a 12 shot panorama, at 10s exposure each, that would take an hour to shoot (best case, and more than twice that if the camera’s internal NR is turned on, which doubles the time per shot). How do you get it to stitch together accurately when taking shots over such a long period of time, while maintaining the foreground. Wont the sky have shifted by then? For the SharpStar I wrapped the edges with gaffer tape and now I just hold it onthe end of my lens, focus and then put it away. The filter holders are kind of a pain. This experience will vary a lot depending on the lens. Very wide angle or slower (lower f/number) lenses will be much more sensitive to an off-center sharpstar2 and will be much more difficult to hand hold.